Meet the world's lightest 5x zoom lens with an f/2.8-4 aperture*, which is excellent for softening foregrounds or backgrounds and highlighting your subject. 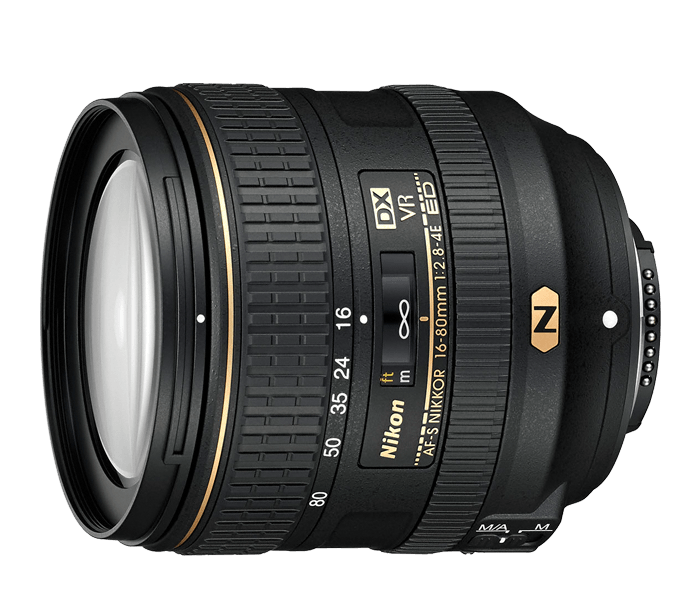 On a DX-format camera, it's zoom range is equivalent to Nikon's 24-120mm FX lens (35mm format), a staple in many pro camera bags. Unleash the power of your high-resolution Nikon DSLR. Nano Crystal Coat virtually eliminates glare, while Extra-low Dispersion Glass and Aspherical elements reduce color aberration and enhance sharpness and contrast. Capture vibrant colours, rich tonality and a level of detail that's staggering. In low light situations, the 16-80mm's VR image stabilization lets you shoot handheld up to 4 shutter speeds slower to gather more of the available light without causing blur. There's even a specialized Tripod VR mode, a first for this zoom range*, that eliminates the effects of tripod vibration. *Among 5x normal zoom lenses with the f/2.8 maximum aperture at the maximum wide-angle position, compatible with lens-interchangeable digital SLR cameras employing APS-C-format image sensor, available as of June 3, 2015. Statement based on Nikon research. **Based on CIPA Standard. This value is achieved when DX-format compatible lenses are attached to a DX-format digital SLR camera and zoom lenses are set at the maximum telephoto position.